A good value airless sprayer that really does the job. Much more cost effective than renting an airless sprayer for a week. Cost: Under $200 on sale (nearly always), easy to operate, sprays well. Covers big areas in a short period of time. 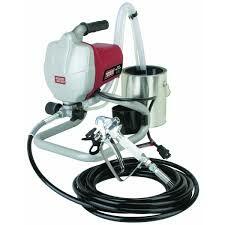 Many parts interchangeable with other name brand sprayers. 25′ hose is too short for house painting. Spray Gun filter hard to remove. Spray gun instructions show wrong model gun. I bought this sprayer because I was going to paint my house. Also, it had good reviews on Harbor Freight plus the fact that renting an airless sprayer for a week was going to cost me more than I could buy it for at HF. I had never used an airless sprayer but had experience using air pressure sprayers. I knew from experience that painting (actually, staining) an entire house was not a good idea using an air sprayer. We’re talking about delivering 14 gallons of stain to the surface of a medium sized house. Using the airless sprayer was the only way to go. Opening the box, the spray gun is separately boxed with the spray tip, 2 fine mesh filters and a cleaning brush and a folded set of instructions. I always familiarize myself with my tools so I took the gun apart removing the spray guard and tip plus opened the filter compartment in the handle. Opening the filter involved using a 7/8″ wrench to grip the nut just below the trigger guard. There are two nuts there, but the outer one closest to the hose fitting is really just a swivel joint so that the attached paint hose will not tangle or twist too badly while in use. I had a difficult time removing the mesh filter and the instructions were of no help at all. I had to reach in with a needle nose pliers and unscrew the filter tab then pull the filter and spring out. The inner end of the filter does not want to come out so the filter, spring and filter tab are the only pieces that came out. Once satisfied that I knew how it all looked when new, I put it all back together. It was not clear where the Teflon washer went – above or below the trigger guard. Since it was supposed to be a seal, I figured it went against the handle above the trigger guard and the instructions and parts list did not show it. I was wrong (see below). Tips come in various sizes and the numbers contain two pieces of information: how wide the fan patter will be and how big the orifice is. The first number (3,4,5, etc.) is half the number of inches that the fan spray will be while holding the gun 1 foot away from the surface to be painted. A 3xx tip will have a 6″ fan pattern, a 4xx will have an 8″ and a 5xx will have a 10″ pattern. Some research into which size spray tip to use for a thin stain told me that the 515 tip that comes with the sprayer is fine for thicker latex paints but an 11-13 size tip was better for the thinner stain. I decided that an 8″ spray pattern was a good choice so I ordered a Reversible Airless Spray Tip 413 silver for Wagner, Graco, and Titan – ProSource Brand #141263762807. It worked like a charm. I needed to get the feel of this sprayer before I started painting, so I un-boxed it, attached the hose and gun. I unwound the hose so it was uncoiled and lay flat in the driveway. I primed it using water and sprayed patterns on the driveway. It was a good learning experience on getting it primed and ready to paint so I recommend that you do the same. Priming was easy by putting the suction hose into a 5-gallon bucket of water and the primer tube into another smaller bucket. I turned the lever to prime and turned it on. In 10-20 seconds a spurting stream of water was coming out of the primer tube. I put the primer tube back into the bucket of water with the suction hose and moved the lever to spray, st the pressure to low spray and turned it on. It took a few seconds to pressurize the hose and gun, but most of it was air. Heeding the warnings of “injection hazard” I faced the spray gun toward the driveway and pulled the trigger. The trapped air came out and the water starting spraying in a fan pattern. When I released the trigger, the base of the gun was leaking. I had put the Teflon washer on the gun back incorrectly. I turned off and depressurized the entire sprayer then removed the gun from the hose. I opened the filter compartment and placed the Teflon washer under the trigger guard and re-tightened it and put the hose back on. Everything worked fine after that. Once pressurized, the sprayer motor turns off and only goes on when you are using the sprayer. It has a whirring sound for a second or two then shuts down unless you continue to use paint. Once I was ready to spray the house, the spray gun delivered the oil stain to the siding evenly and effectively. I needed to back brush the stain into the rough cedar siding, so I would spray about 6 feet of board, usually 2-4 at a time, then back brush the stain into all the nooks and crannies of the wood. As I became more accustomed to the speed of delivery, I could cover 30′ of siding and back brush it in about 5 minutes. So I would spray with one hand and brush with the other. The only thing slowing down the process was my tired arms. It’s important to keep a wet edge while painting or staining otherwise you get lap marks that will show for years to come. So try to complete a board from end to end while wet, then move up to the next board. When I needed to go to the highest peaks of the house, a ladder would not do because the stain would start to dry each time I descended the ladder, moved it, and ascended to paint the next 4-6 feet. Besides being exhausting when you’re up 25 feet, I was making lap marks. So I rented a cherry picker (aerial bucket lift or aerial work platform – AWP). This was the best investment of the project because I did not have any more lap marks and I completed 80% of the house in 2 days. The lift review is a subject for another post. Overnight, I simply put the suction hose into a gallon of mineral spirits (water for those using Latex paints) and flushed out the pump, spray gun and hose. I turned off the pump, moved the lever to “prime”, reduced the pressure to the “prime” setting, put the primer hose into the paint bucket and then started the pump for 10 seconds or so to save the paint from the pump. Then I removed the spray tip from the gun, aimed the gun into the paint bucket and pulled the trigger and held it while turning on the pump (so that it didn’t pressurize fully). The paint came out of the hose and gun in about 10 seconds. Then I move the gun and primer hose to a “dirty mineral spirits” bucket and ran more spirits through the gun in the same fashion. When it was deep enough, I put the suction hose into the dirty mineral spirits bucket too and let it run for 30 seconds as it’s second wash. I put the suction hose into the clean spirits and ran the pump until both the spray gun and primer hose were clear. This took about 20-30 minutes. I also cleans residue paint from the gun, hoses, and pump using stiff brushes to get into the crevices. For longer term storage, I did the same, then took the filter out of the gun and cleaned it all up well. I took the hose off and emptied the mineral spirits from it. I left mineral spirits in the pump. If I decide that I won’t use it for several months, I’ll empty the mineral spirits out of the pump and put a few drops of household oil into the pump by turning it upside down and removing the suction and primer hoses, run the pump for 5 seconds and seal it all up for storage. The instructions come with a warning about no returns accepted unless the unit is clean. Well forget it. You can never fully clean a paint sprayer, hose, gun, etc. without leaving some traces of paint. I would recommend trying it with water to see if it works as expected. Unless you paint professionally, you won’t need a top brand airless sprayer. If you can spray paint your project in one day, rent a sprayer. If your project is large and you need more than several days, buy this Harbor Freight airless sprayer. It will give you time to learn how to use it well and will do the job leaving a nice smooth finish to your project. It was well worth the investment for my house painting project. Very often you can find a pdf manual right on the HF website. I didn’t find the manual very helpful though. Yes – they change model numbers all the time as newer products come out. I’m looking to do the same thing and thought your writeup was perfect. Do you know what the Graco offers over the HF that you think you would notice? I think Graco offers the brand name confidence and the ability to be sure you have selected the right tips or accessories. The confusion is really from the many models that Graco has to offer so their own accessories have to be paired up with the model. Other than that, I did not notice any missing functionality and the Harbor Freight worked beautifully. I don’t think having a Graco sprayer would have made any difference, unless I painted for a living where a heavy daily use may start shaking out any reliability differences. I lost my Krause & Becker (Harbor Freight) spray nozzle. Harbor Freight sells the sprayer but don’t sell replacement parts. Will Graco nozzles work? No one seems to sell the parts for my sprayer. I bought a Graco nozzle for stain that fit right in this sprayer. I don;t know how many other parts are interchangeable but I would guess quite a few. The nozzle worked great. Try a Graco reseller or big-box retailer for the parts you need. was technical problem and for me to call back at another time. I’m not sure if I have a defective spray gun or if the instructions are incorrect. Has anyone else had this problem with the filter screen not coming out the bottom of the handle? I had a little trouble opening the bottom of the spray gun handle because the instructions were not very clear. After using two wrenches and separating the paint tube connector, I found the screen difficult to remove too. I used a bent paper clip to reach in there and work it out from the bottom. The screen was catching on the inside edge of the screw threads. there are 2 youtube on removing the filter that are very good – one is really good, Bart did a good job describing it but seeing exactly how is better. Bart what area are you in and what did the cherry picker cost you? Did you write a review on that yet? I did write a review on the cherry picker (Aerial Work Platform) here: http://howto.liteknight.com/review-nifty-sd50-aerial-work-platform-first-time-user/ . I had it from Friday afternoon through Monday noon and it cost about $700. Well worth it. In addition to painting the house, I managed to clean my gutters and cut some overhanging tree limbs, and point the chimney too. My brother and I were trying to prime his wooden house using this sprayer. It is brand new right out of the box, but couldn’t get it to keep spraying. It would spray good for a few seconds and then the spray would become uneven and paint would squirt out the side and all down the gun. We spent more time cleaning than painting. We were using Killz straight out of the bucket, no thinning. I’d appreciate any advice on how to resolve the problem. Thanks! Actually, kilz will spray through most any tip. The issue with this pump is it cant keep up with high paced projects. A smaller tip, say a 4-13 would be perfect. A little thinning wouldnt hurt, but not so much that you loose adequate coverage. Realistically, latex kilz is funtionally garbage, might as well bite the (i hate oil) bullet and use oil. I would just ensure that the generator is rated for the sprayer’s motor and go for it. Used the Harbor Freight sprayer to paint my fence. It lasted about five minutes and then quit! Wouldn’t make any noise or spray anything! I spent $200 for 5 minutes! I checked all the obvious things: power source, cord seemed adequate, paint not lumpy…found nothing wrong. I couldn’t clean it because it quit working & it can’t be returned unless clean! Called help line ( printed on every page in manual )and it wouldn’t even ring….what on earth went wrong? My roommate who is a electrician could not figure it out either other than to say he thought a more expensive machine would have been better. Interesting. Sorry to hear of those troubles. I’ve had mine for over 3 years and no troubles at all. Sometimes Harbor freight sources their products from other manufacturers and change the model or item number. Maybe it was a bad batch? As far as cleaning, did you really mean 20-30 MINUTES of cleaning with mineral spirits? How much mineral spirits did that take? Not a lot. I reuse it until the sprayer is clean, then use a small amount of fresh spirits to do the final pass. Purchased harbor freight airless sprayer, used it the first day to paint soffit, gutters, downspouts (changed tip to graco310, also had to swap out tip guard to rac x) worked out wonderful. 2nd day to paint stucco walls I lost pressure slowly till nothing came out. Turns out the filter went bad. Plastic piece of filter was jamming in and cutting off pressure. Works when the filter is removed. Hope this helps for people at least trying to clean it out. Still worth the price. If you purchase anything from harbor freights that’s over $100.00 you should invest in a warranty.